I have eaten a lot of Bibimbap (meaning 'mixed bowl') in my time and I have to say that HoSu Bistro on Queen West has one of the best bowls in Toronto. 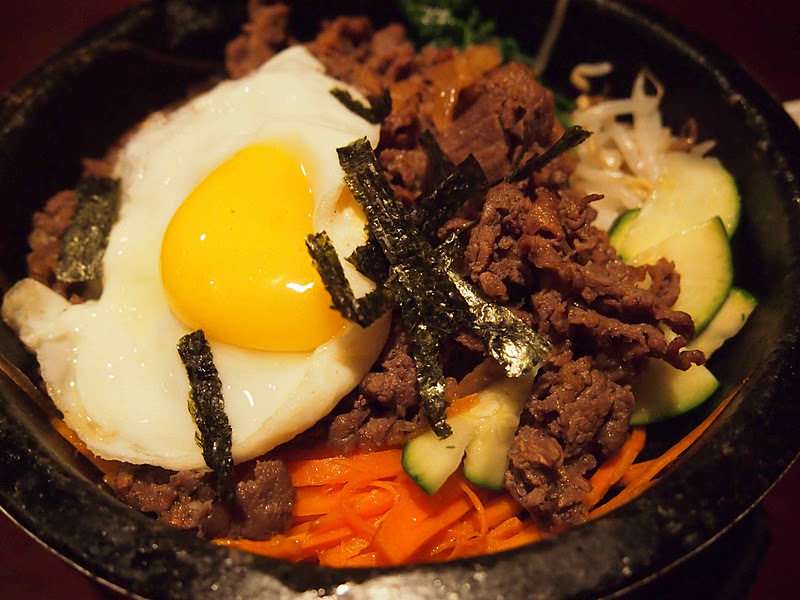 Their Bibimbap Dolsot ($9.95) is served in a very hot stone bowl (ow - don't touch it ) with thinly sliced marinated beef and a lightly fried egg that you can mix into your rice or cook on the side of your bowl. It eats like a hearty meal on a cold Toronto day with shredded carrot, half-rounds of zucchini, slippery glass noodles and blanched spinach and bean sprouts. Let the rice sit on the bottom and you will have delicious crispy bits to look forward to by the end. 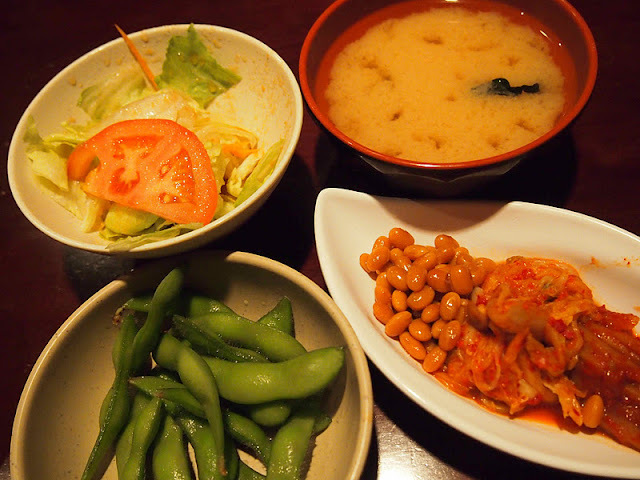 It's a cheap healthy meal for only $10 and includes a bowl of miso soup, garden salad, steamed edamame, kimchi, pickled radish and soybeans. I don't think they even charged me for my green tea. It's no wonder HoSu is always packed at lunch and dinner. The food is high quality and the prices are extremely reasonable. 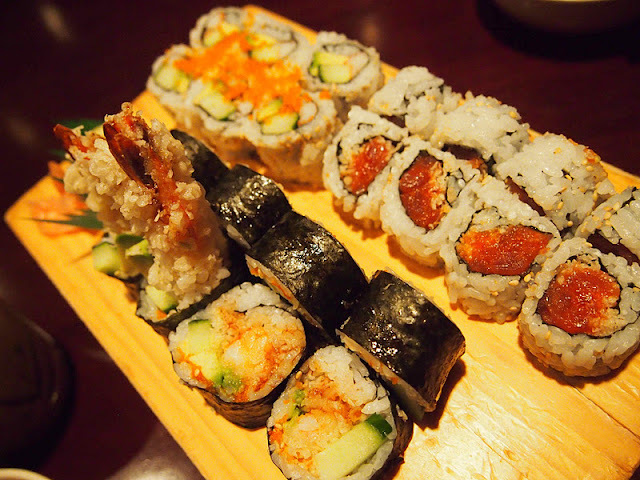 HoSu is where I go when I feel like Korean food and everyone else feels like sushi - you get the best of both worlds. The Maki Sushi Platinum Combo ($13.95) comes fresh and fast and includes six pieces each of dynamite roll, spicy tuna and California. The lunch menu is even cheaper with over 50 items for under $10. Make sure you check out this gem when you're in Toronto's Entertainment District. HoSu is a nice change up from the poutine, burritos, hot dogs and shawarma that is abundant in the neighbourhood. Where is the best Bibimbap in Toronto? Tell us your favourite place in the comments below - I am on the hunt! The best bibimbap can actually be found in Korean Grill House just down Queen St. West. HoSu Bistro actually has bad bibimbap. I've been there three times and each time, my friend or I have tried their dishes. The problem is with their rice. It's undercooked, soggy and not crispy at all (which is essential in bibimbap dishes). I have to disagree with you. There's a lot of other cheap places to get this delicious Korean dish. 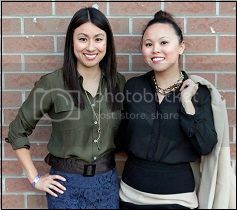 Try Koreatown (Bloor/Christie) or the Grill house I mentioned above. I never would have thought Korean Grill House would have decent bibimbap. I thought their focus would have been the BBQ. Will definitely have to try this. Try Bi Bim Bap restaurant near Eglinton West. Ask for the owner. He will tell you all you ever wanted to know about Bi Bim Bap. Oh Yea, try the Taco!